Bootie LA pays mashup tribute to the rock stars and pop artists who’ve left us too soon, from Kurt Cobain and Freddy Mercury to Amy Winehouse and Prince, and everyone in-between! No genre or era is safe! Only $5 before 10 PM! The world of pop and rock music has way too many artists who’ve left well before their time, but we’ve been lucky enough that they’ve left an enormous amount of music to remember them by. 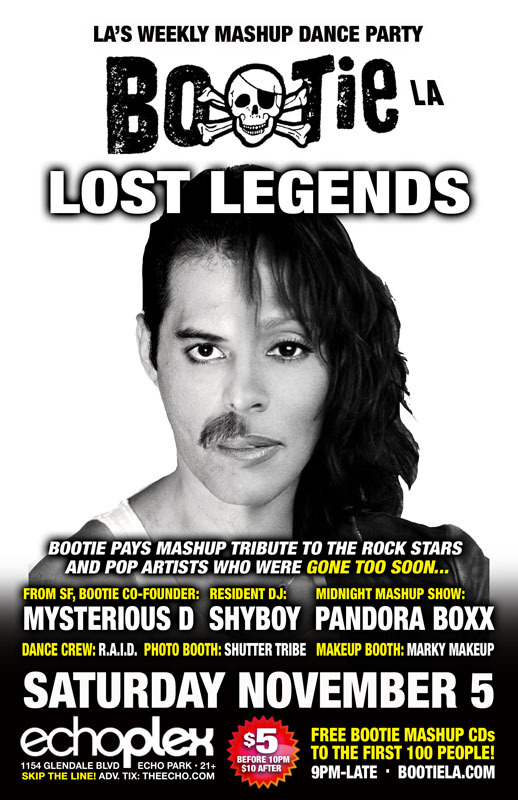 Kurt Cobain, Prince, David Bowie, Donna Summer, Amy Winehouse, Jim Morrison, Notorious B.I.G., Mike D, Freddie Mercury, Whitney Houston, Tupac, and the list goes on … but tonight Bootie celebrates their legacies by mashing them up — with each other and with anybody and everybody! Mysterious D comes down from San Francisco to join resident DJ ShyBoy as they spin the very best mashups featuring the greatest rock and pop artists we’ve lost! For the Midnight Mashup Show, drag queen Pandora Boxx from RuPaul’s Drag Race performs a special tribute number! Plus resident dance crew R.A.I.D. (Random Acts of Irreverent Dance) takes over the stage with their usual go-go madness, while Marky Makeup gives your faces and bodies a makeover, and Shutter Tribe captures all the fun! All this, plus FREE Bootie mashup CDs for the first 100 people through the door!